Occasionally I describe myself as a hand-builder at heart, trapped in a wheel-thrower’s body. I love putting parts together at the table. But since sensuality is one of the qualities that I hope characterizes what I make, the liveliness that wheel working can put into the clay continues to be my starting point. I remember once reading that an artist gets one good idea (except for that damned Picasso!) and then explores and reworks that idea over a lifetime. At Shakerag I’ll go back and revisit some older forms, useful for demonstrating their techniques, but catch up to what has recently caught my attention. Hollow rims are showing up in a lot of my pots, and a trip out west has recently dropped hoodoos into my mix. We’ll talk about and demonstrate decorating and glazing, but pots will only be bisqued, not glaze fired. Our class will take time – cocktail conversations – to talk about the many questions and issues that come from working in a studio. Lana and I hope to steal some ideas from one another and paint each other into a corner as we work, an exchange which we hope will be entertaining and enlivening for all. In all of this making and talking I’ll be most curious about what you as my class members are up to. Come expecting lots of interchange, and laughter. Nick Joerling is a full-time studio potter who has maintained a studio in Penland, North Carolina since the mid-1980's. He received a B.A. in History from the University of Dayton, Ohio, and an M.F.A. in Ceramics from Louisiana State University in 1986. 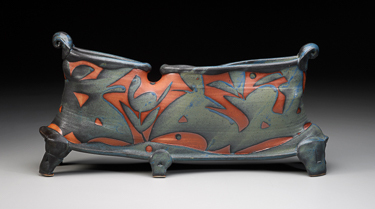 He has taught in craft programs in the United States and abroad, been widely reviewed and exhibited, and is represented in public and private collections. It's nice, 30 years in, to find myself today as eager to be in the studio as when I first began, and to recognize that the things that come from a studio life – security and risk, independence and community, mental and physical engagement – continue to be challenging and meaningful.